The picture above was taken from the John Seigenthaler Pedestrian Bridge. 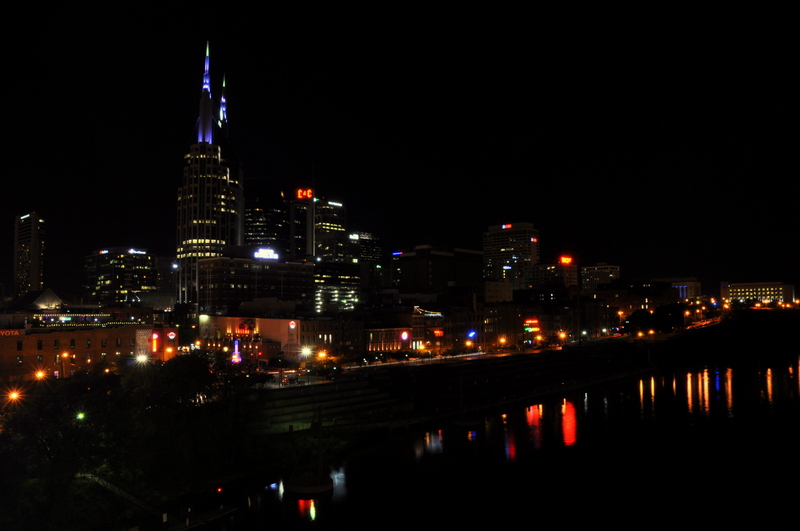 The prominent building on the left, the tallest in Tennessee, houses the regional offices for AT&T, but is affectionately referred to as the “Batman” building. 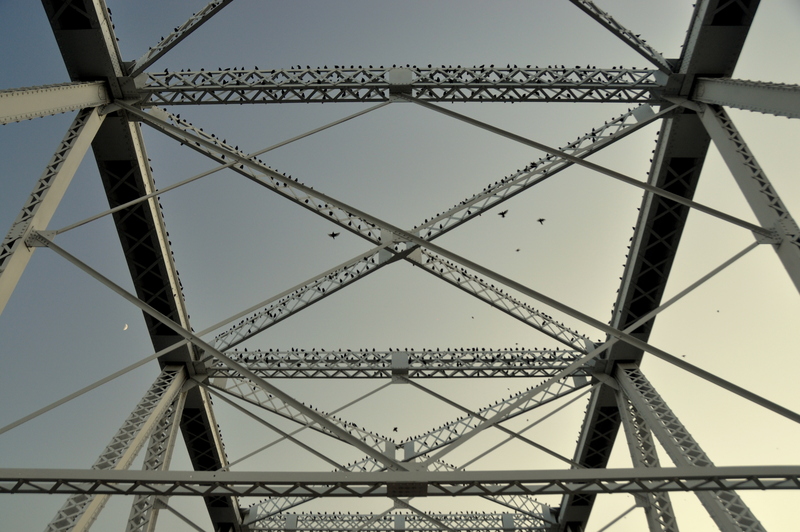 The bridge, erected in 1909, spans over 3,000 feet and was turned into a pedestrian promenade in 1998 after it was determined that the bridge could no longer handle the city’s increasing traffic. It was added to the National Register of Historic Places later that same year. The city’s pigeons rejoiced. Three separate photos, later stitched together, comprise the above image. The bridge, from which the pictures were taken, is a popular spot for sunset strolls and bike rides. 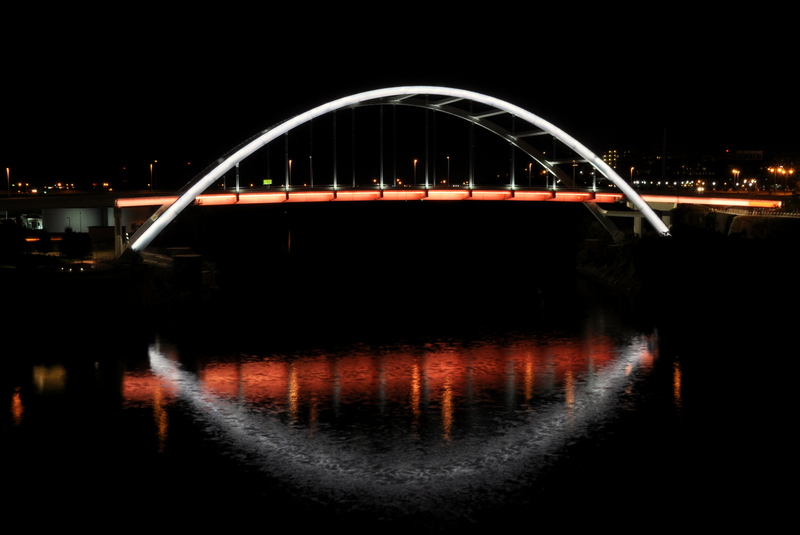 The Korean Veterans Bridge, pictured above, is a stone’s throw from downtown as well. Note the gantries on the left. 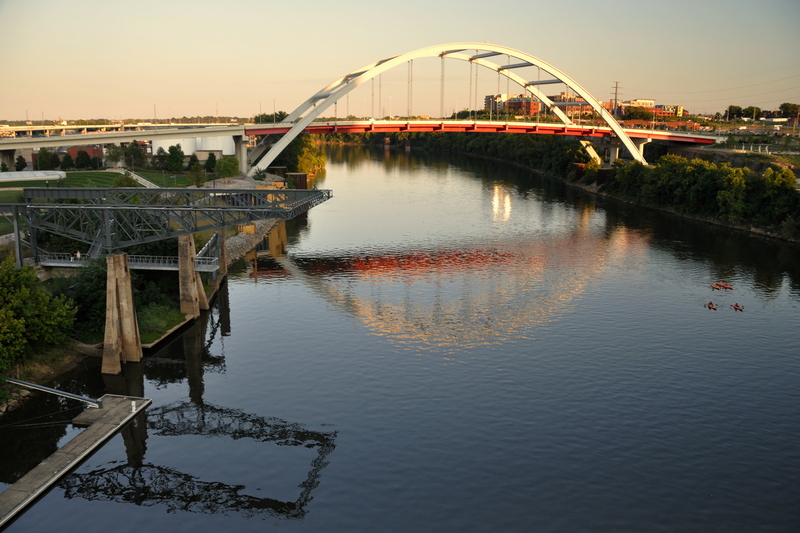 The Cumberland River Greenway, a stop-and-start series of riverside walkways, passes by those gantries and offers launching points for kayakers such as those in the picture. Access to this particular stretch of walkway is via an elevator on the east side of the Seigenthaler Bridge. 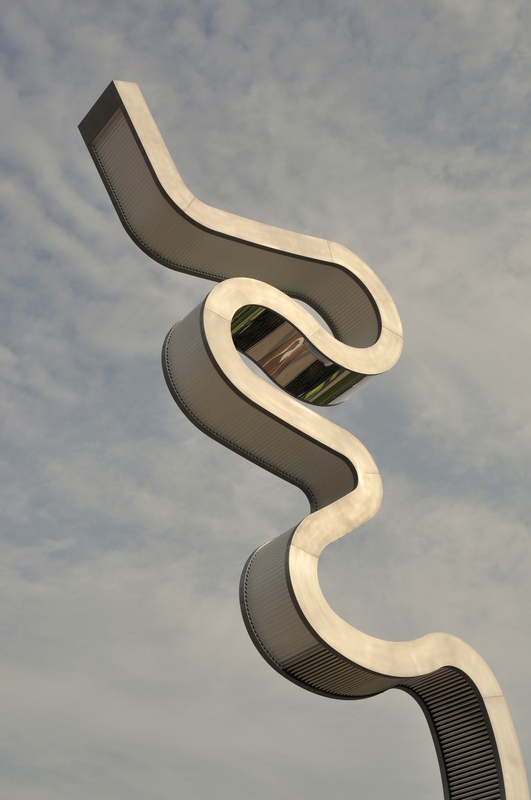 Sculpture at Riverfront Park, part of the Cumberland River Greenway. 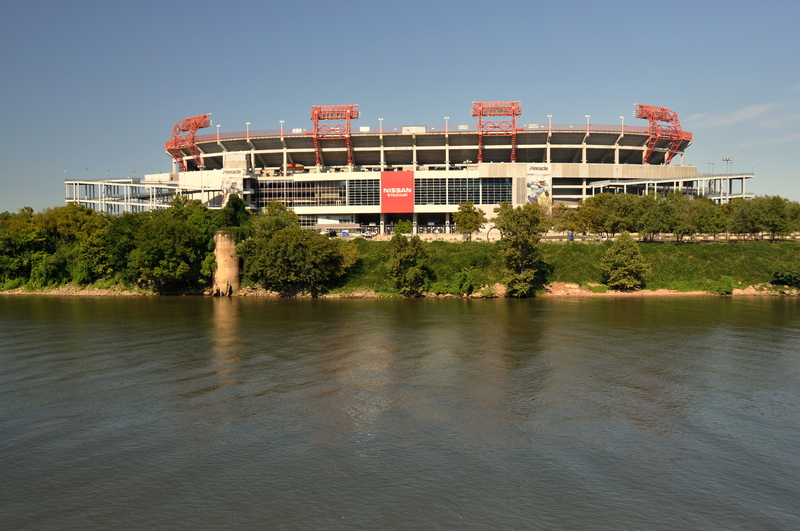 Nissan Stadium, due north of the Seigenthaler Bridge and directly across the river from downtown Nashville. The last-place Tennessee Titans (previously the Houston Oilers) play here. 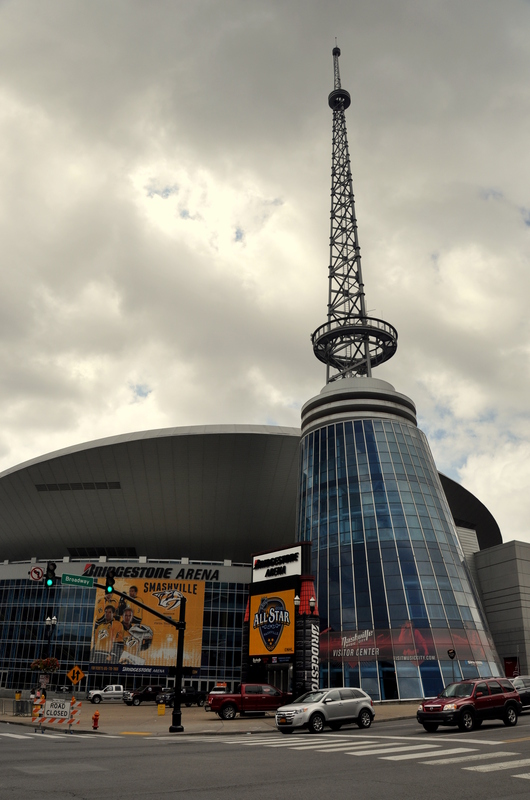 Four blocks east of Nissan Stadium, along Broadway Avenue, lies the Bridgestone Arena, home of the aforementioned Predators. I have never attended a game here but can tell by merely watching one on TV that the acoustics are impressive and the crowd’s energy is infectious. Go Preds! 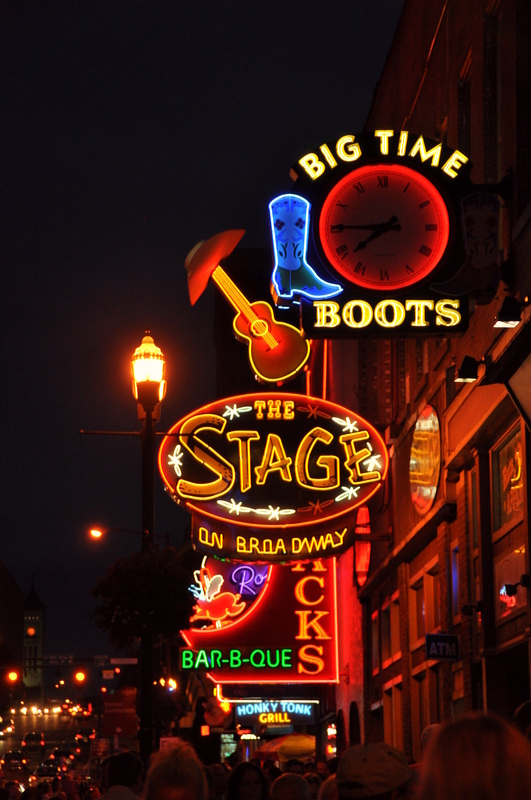 Broadway, home to more honky-tonks than any country music star can possibly sing about, is where you’ll find Nashville’s barely-legal crowd – Vanderbilt University coeds, mostly – the majority of them decked out in cowboy boots and hats. 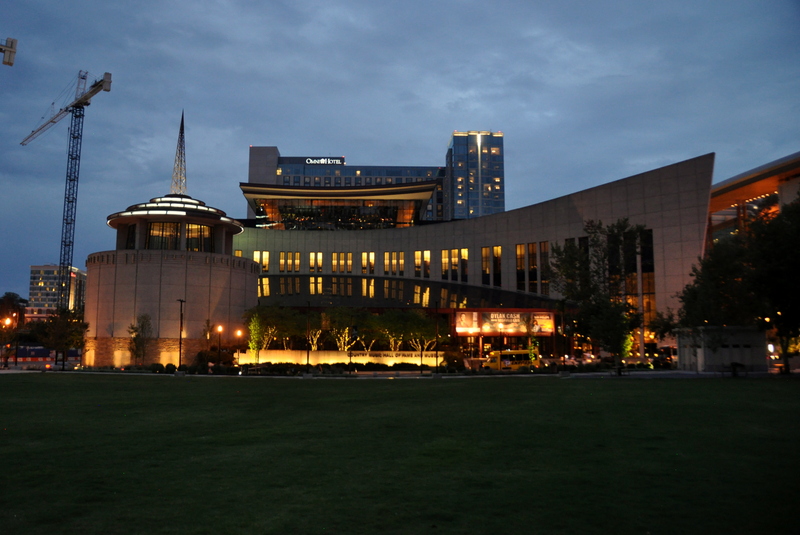 A few blocks away is the Country Music Hall of Fame, which was built to resemble a piano keyboard. Admission is – wait for it – $24.95. Yikes! 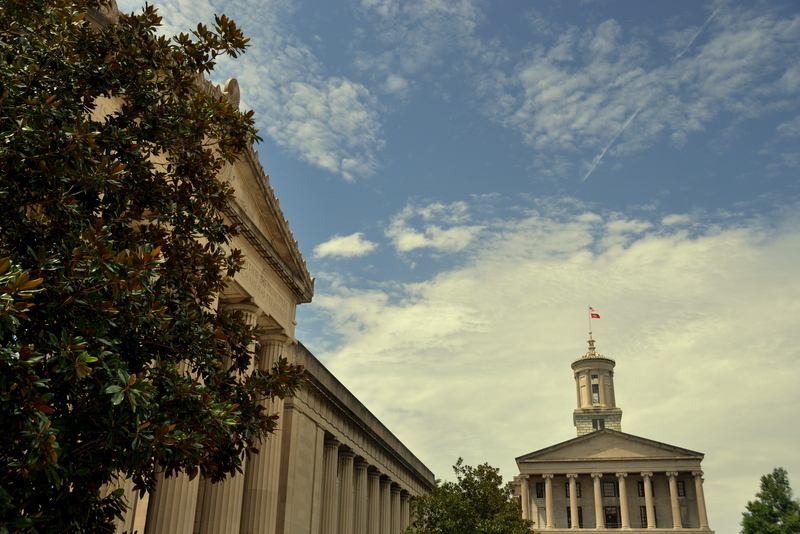 The Music City Walk of Fame fronts the Country Music Hall of Fame. Respectfully, the Walk of Fame gives shouts to non-country legends as well. 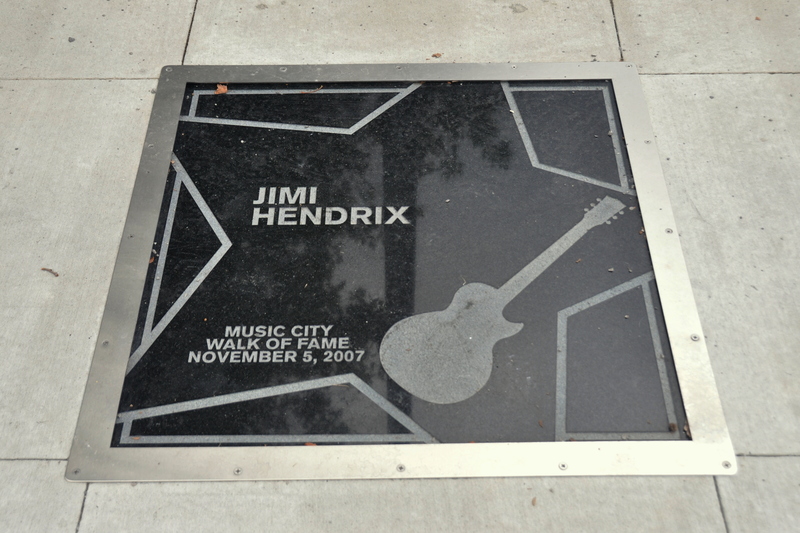 Jimi Hendrix has a marker here, as do Cece Winans, Les Paul, and even Jack White. 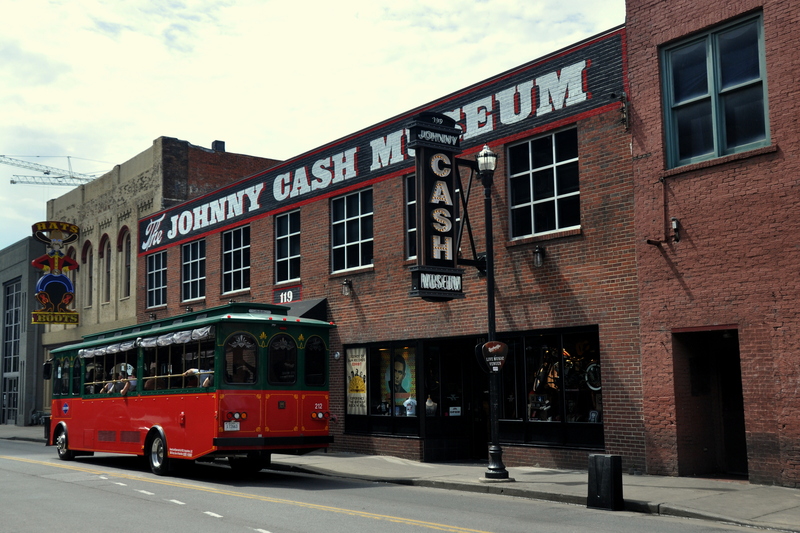 Two blocks from here and visible from the Seigenthaler Bridge, the Johnny Cash Museum is a popular stop for the city’s hop-on, hop-off tourist trolley. Admission is a bit steep at $15, but AAA discounts are available, and as a fan of the Man in Black, I found it worth the splurge. 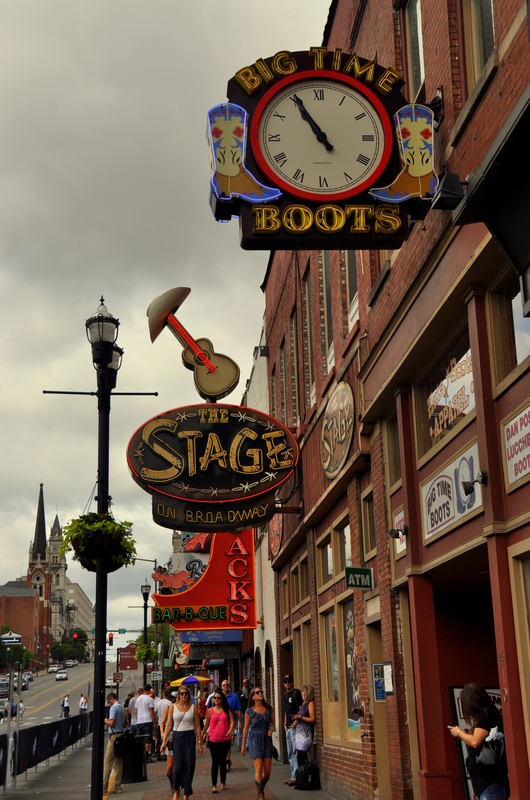 Nashville is about much more than just music. 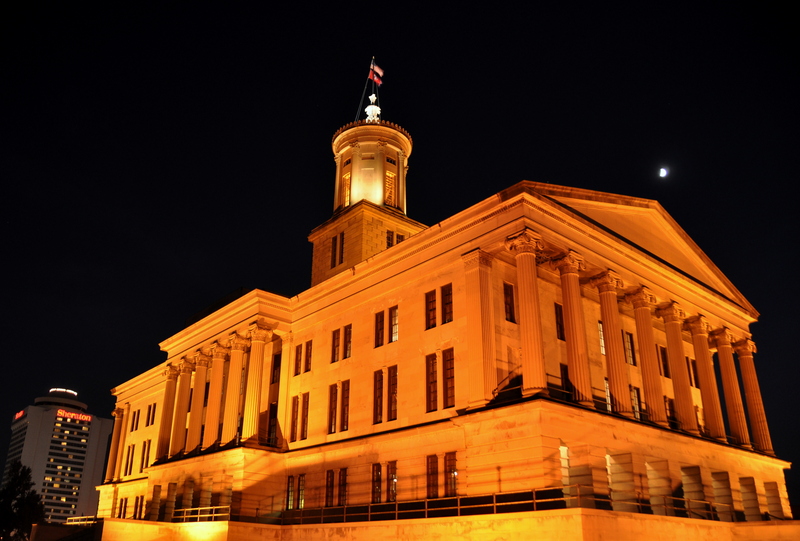 It is the state capital of the 17th-most-populous state in the U.S. The state house, above (pictured to the right of the War Memorial Auditorium), is appropriately perched atop the highest point in downtown, and is visible from almost anywhere. Tours of the state house are free. Be sure to return after dark to see the building under the floodlights. …and I highly recommend doing so.